Is there anything more likely to evoke a mixture of emotions quite like travel? You may be going to visit relatives on a holiday, coming home from a vacation, going to a business appointment or event out of town, or just heading home after a long day at work or visiting people. If you are in the moment and feel the connections to what you’re doing, you may be moved by how this experience is universal yet unique. Universal in that everyone has traveled and felt what you’re feeling. Unique in that no one is right there, right now, feeling and seeing and thinking the exact same thing. There is a reason that so many books and movies have been written about the Road in one sense or another. It’s one of those things that ties us together into a civilization. Letting the road fall into disrepair is a sign of a society in decline. Conquerors always build new roads to make it easier to move troops and supplies. Rebels tend to both use the roads and to destroy them to prevent their use by those they are rebelling against. Roads are also what ties the places that matter to us together. Even if instant transportation were invented tomorrow, roads would still matter, for without them, we’d be disconnected from our pasts and unable to adapt to the changes coming in our futures. 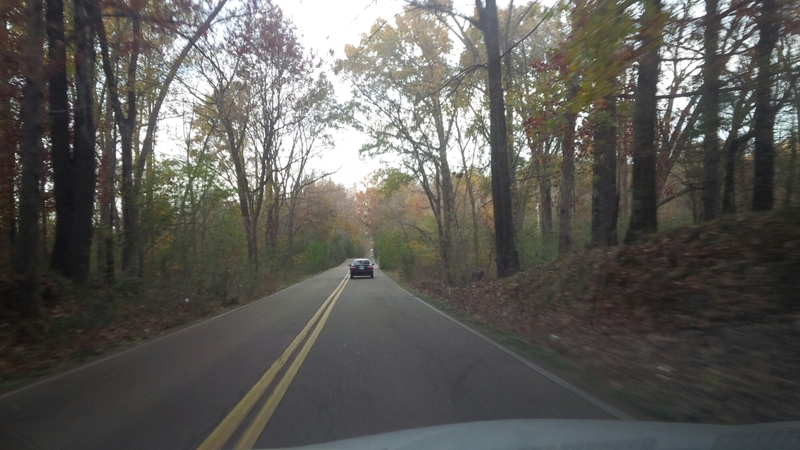 This entry was posted in General Sharing and tagged #10minwri, home, Mississippi, Roads, Tennessee, Thanksgiving, travel. Bookmark the permalink. Meet Minister Is A Verb! !